Pepeducreux is my favorite of the Series 5 cards. It’s strong visually. The historization of one of the most well-known lyrics in all of hip hop is clever (still gives me a chuckle). 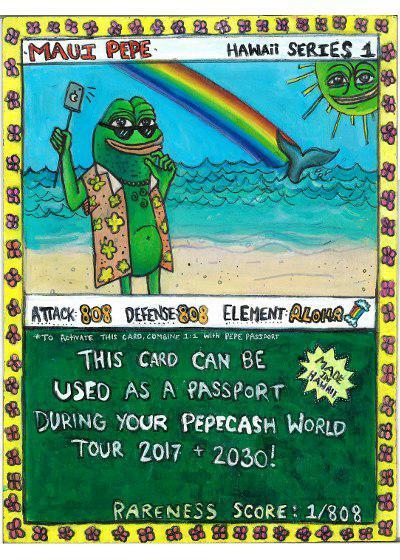 The card is a pepe-fied adaptation of Ducreux’s famous self-portrait. Baron Joseph Ducreux was an OG. He was was a French nobleman, portrait painter, pastelist, miniaturist, and engraver. He was also the painter to the royal court of France. He didn’t sign a lot of his paintings. Which might make you think he’s the opposite of a boasting, bragging rapper but you would be wrong in thinking that. Ducreux did something different. He injected personality and individuality into the most popular art form of the time, portraiture. In much the same way, hip hop revived popular music and changed it forever. As a collective, rappers have become the seers of the modern era. Predicting your future because they are living it now. I take rap seriously: the camo, the coded language, the adoption of words (gorilla for guerilla, soulja for soldier, etc) so we can transmit ideas and hide out in the open at the same time. Rappers have been fomenting cultural change since the dawn of hip hop. Some go big (Dead Presidents, Killer Mike), more are subtle (Nas, Scarface, WuTang, GangStarr) and, like Ducreux, they’ve profoundly influenced popular culture and changed music forever. 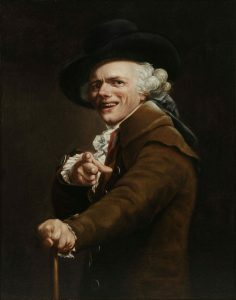 A revolutionary artist and visionary, Ducreux was an OG and Pepeducreux is his great, great, great grandson.